Concord, NC (February 20, 2017) – Saturday’s ARCA Racing Series presented by Menards season-opening Lucas Oil Complete Engine Treatment 200 Driven by General Tire at Daytona International Speedway is officially in the rear view mirror. The Florida rains held off but a dramatic multi-car crash on lap 75 forced ARCA officials to waive the red flag and freeze the field, ending the scheduled 80-lap feature prematurely. With a potent three-car team effort, Venturini Motorsports once again displayed their strength on the high-banks of Daytona but was unlucky and unable to capture the highly-desirable Daytona trophy. Tom Hessert, driving VMS’ No.25 Andrews-Renton Coil Spring Toyota, started from the pole position and led the first 21-laps of the race before settling for fifth. Leilani Munter, seemingly in the midst of a career day, was tagged from behind while running top-10 during the final stages of the race, causing damage to her No.15 Vegan Powered-A Well-Fed World Toyota relinquishing the firey driver to a hard fought 19th place finish. Noah Gragson, who set the top speed in Thursday’s lone ARCA practice session concluded with a disappointing 26th place finish behind the wheel of his heavily favorited No.55 Musselman’s Big Cup Apple Sauce Toyota. The next race for VMS and the ARCA Racing Series presented by Menards is the Music City 200 at Fairgrounds Speedway Nashville on April 8 where Christian Eckes will make his return with VMS in the No. 15 Toyota and drivers Raphael Lessard (No.25) and Zane Smith (No.55) will make their series debut. Tom Hessert returned from the long offseason primed and ready to avenge his career-long search for Daytona glory. Last year’s second-place driver in the national point standings showed consistent speed throughout Speedweeks highlighted by his fifth career General Tire Pole Award leading up to Saturday’s ARCA Racing Series presented by Menards season opener at Daytona International Speedway. Starting from the top spot, Hessert, a native of Cherry Hill, NJ, led the first 21-laps of the series’ most anticipated race of the season from the driver’s seat of VMS’s No.25 Andrews-Renton Coil Spring Toyota. Bringing the field down pit road under caution on lap 21 Hessert relinquished the lead. Attempting to regain the lead positon, Hessert used his Daytona experience to stay within striking distance keeping his Toyota firmly in the front running pack. Chasing down the leaders during the final laps, Hessert’s fate was determined after the sixth caution flag and second red flag waived on lap-75 of the scheduled 80-lap event due to a huge multi-car wreck on the front stretch. Due to time restrictions impeding the start of the NASCAR Clash and apparent damage to the outside safe barrier wall the race was called and deemed official. Hessert, running fifth at the time of the caution flag was credited with his second top-5 finish in ten Daytona attempts. 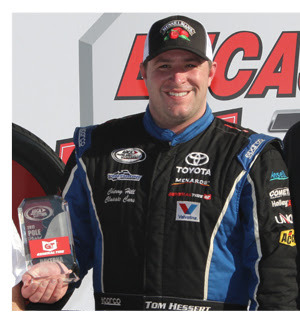 Hessert will return to series action driving VMS’s No.25 Toyota at Talladega Superspeedway on May 5. Celebrating her 43rd birthday, Leilani Munter strapped into her No.15 Vegan Powered Toyota Saturday afternoon at Daytona International Speedway determined to compete for the win on racing’s biggest stage. Recognized simply as Leilani, the part-time series’ driver and full-time activist to many causes, brought her many adorning fans to their feet as she raced her way into the top-5 during the late stages of the ARCA Racing Series presented by Menards season-opener at Daytona. After qualifying in the 17th position out of a stacked 40-car starting field, Leilani displayed an equal balance of patience and skill as she drove her Vegan Powered car up through the field. With the top six leaders breaking away Leilani led a second pack of cars chasing them down. Catching the lead pack Leilani used the draft to catapult herself into the fourth running position as the race neared the end. After a caution and race restart with 24-laps remaining Leilani found herself firmly within the bottom line of the two groups as they circled the daunting 2.5 mile superspeedway approaching speeds of 200 mph. Running nose to tail in the lead group and eyeing a career best finish, Leilani’s hopes came to an abrupt end when the trailing car made contact with her rear bumper sending her Vegan Powered car up the track and into the outside wall – spawning a multi-car incident. With right side damage, Leilani pitted allowing her Venturini Motorsports’ crew to attend to the car and get her back out on the track to finish the race. The melee proved costly as Leilani would not be able to fully recover, ultimately finishing in the 19th position. Despite the finish, Leilani’s efforts were praised by the team and the large group of supporters on-hand for her drive. Among the group of family and friends at Daytona lending their support was Leilani’s brother-in-law and founding member and singer/guitarist of the Grateful Dead, Bob Weir. Leilani, recently featured on FOX Sport’s NASCAR Race Hub program as part of their special “Women in Wheels” series, will remain in Daytona throughout next Sunday’s Daytona 500 educating race fans and passing out Vegan food samples from her Vegan themed display tent located in the fan zone at Daytona International Speedway. The Daytona race was Leilani’s only scheduled race of the 2017 season. It’s not the finish 18-year old rookie Noah Gragson had wished. Gragson, a native of Las Vegas, Nevada, arrived in Daytona with his Venturini Motorsports – Musselman’s Apple Sauce backed team as one of the favorites competing in the ARCA Racing Series presented by Menards season-opening event. Gragson, who dominated last week’s series practice session at Daytona International Speedway leading up to ARCA’s weekend Lucas Oil 200 Driven by General Tire event, suffered a devastating blow in Saturday’s race after a mechanical issue on his No.55 Musselman’s Big Cup Apple Sauce Toyota delayed his Daytona bid scoring a 26th place finish. Forced to make an early unscheduled pit stop, Gragson’s hopes were crushed as his Musselman’s racing team were forced to work extra-long in order to return him to action. Down but not out, Gragson remained calm and with crew chief Billy Venturini’s advice, shifted focus on competing hard the remainder of the race to gain experience for his upcoming NASCAR Camping World Truck Series start driving the No.18 Switch Toyota Tundra for Kyle Busch Motorsports in Friday night’s truck series opener. Returning to the track Gragson picked up where he left off earlier in the week by posting the fastest lap of the race with a blistering time of 46.918 seconds and an average speed of 191.824 mph. Furthermore, Gragson, part of a three-car Venturini Motorsports effort, demonstrate his maturity level and sense of teamwork when he radioed into the pits during the late stages of the race to tell the 25-team of Tom Hessert he was determined to drive up to his bumper and give Hessert the help he needed as he challenged for the win. With momentum riding and Hessert in sight, Gragson surged forward on the fifth restart of the night. The plan devised by Gragson began to take shape until the caution and red flag came out simultaneously on lap 75 of 80 freezing the field before ARCA’s race control officials called the race prematurely due to time restrictions put in place for the start of the NASCAR Clash race which followed the ARCA race. 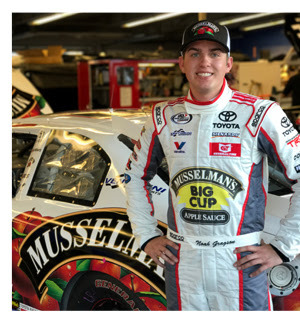 Both Gragson and Hessert, are part of VMS’ six driver rotation set to carry the Musselman’s Apple Sauce brand (Team Musselman’s Racing) on their Toyota’s throughout the 2017 ARCA season. Drivers Zane Smith, Raphael Lessard, Tanner Thorson and Christopher Bell make up the rest of the group. Venturini Motorsports (VMS), fielding cars for over 30-years in the ARCA Racing Series presented by Menards, is one of the premier NASCAR driver development programs in the country. Multiple team championships and consistent on-track success, VMS has evolved into one of the most recognizable names in motorsports. Since 2007, VMS has assisted in the career development of notable NASCAR drivers such as Joey Logano, Erik Jones, William Byron, Justin Allgaier, Alex Bowman, Brian Scott, Ryan Blaney, Brennan Poole, Daniel Suarez, and Brandon Jones. Over the years the Venturini name has become synonymous with modern-day racing in America. In 2012, the Venturini family was inducted into the National Italian American Sports Hall of Fame and now find themselves enshrined with such sports icons as Joe DiMaggio, Mario Andretti, Vince Lombardi, Tommy Lasorda and Rocky Marciano.